It appears no body is using 9moble night plan right from the very first day it was launched, probably because its too expensive considering the fact that you can get the same data with 50% lesser price on other network compare to what 9mobile network is giving you. While subscribers are still yet to recover from the deadly blow unleashed by MTN the previous week, I came to realize that the village people that visited other networks is resident on 9mobile. Right from the very first day of 9mobile night plan launch, it has always remained N200 for 1GB while other network maintains N50 naira for the same 1GB data. Now, MTN is not different from 9mobile night data plan considering their recent changes. 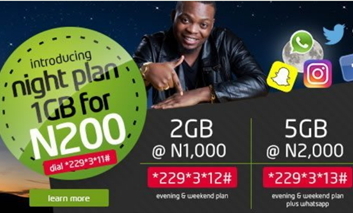 9mobile and MTN night plan are now the same and it seems people rarely use 9mobile night plan from the hour of 12am – 5am. So we’d like to ask you, how many of you are currently using 9mobile night data plan? Now it’s Airtel, waved goodbye to Mtn night plan 9mobile never. Used it once.it was very fast but now AIRTEL is bae. Never used 9mobile night plan before due to the fact that compared to other networks plan it was too expensive. I’m not using there night plan. None of the above 👆👆👆😁😁😁. But still rocking x929x10# 1Gb N200 72hrs 9mobile plan. Just sub tonight to watch ManU n Spur match when Glo was down.